His political life began as an humble worker while he was still a student. He was fortunate to come in early contact with such towering personalities as Hussain Shaheed Suhrawardy and A K Fazlul Huq, both charismatic Chief Ministers of undivided Bengal. Adolescent Mujib grew up under the gathering gloom of stormy politics as the aging British raj in India was falling apart and the Second World War was violently rocking the continents. He witnessed the ravages of the war and the stark realities of the great famine of 1943 in which about five million people lost their lives. The tragic plight of the people under colonial rule turned young Mujib into a rebel. In 1948 a movement was initiated to make Bengali one of the state languages of Pakistan. This can be termed the first stirrings of the movement for an independent Bangladesh. The demand for cultural freedom gradually led to the demand for national independence. 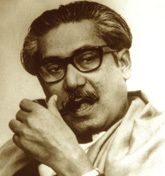 During that language movement Sheikh Mujib was arrested and sent to jail. During the blood-drenched language movement in 1952 he was again arrested and this time he provided inspiring leadership of the movement from inside the jail. March 7, 1971 was a day of supreme test in his life. Nearly two million freedom loving people assembled at the Ramna Race Course Maidan, later renamed Suhrawardy Uddyan, on that day to hear their leader’s command for the battle for liberation. The Pakistani military junta was also waiting to trap him and to shoot down the people on the plea of suppressing a revolt against the state. Sheikh Mujib spoke in a thundering voice but in a masterly well-calculated restrained language. His historic declaration in the meeting was: "Our struggle this time is for freedom. Our struggle this time is for independence." To deny the Pakistani military an excuse for a crackdown, he took care to put forward proposals for a solution of the crisis in a constitutional way and kept the door open for negotiations. 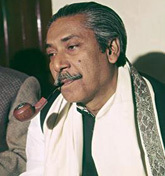 Forced by international pressure and the imperatives of its own domestic predicament, Pakistan was obliged to release Sheikh Mujib from its jail soon after the liberation of Bangladesh and on 10 January 1972 the great leader returned to his beloved land and his admiring nation. But at this critical juncture, his life was cut short by a group of anti-liberation reactionary forces who in a pre-dawn move on 15 August 1975 not only assassinated him but 23 of his family members and close associates. Even his 10 year old son Russel’s life was not spared by the assassins. The only survivors were his two daughters, Sheikh Hasina - now the country’s Prime Minister - and her younger sister Sheikh Rehana, who were then away on a visit to Germany. In killing the father of the Nation, the conspirators ended a most glorious chapter in the history of Bangladesh but they could not end the great leader’s finest legacy- the rejuvenated Bengali nation. In a fitting tribute to his revered memory, the present government has declared August 15 as the national mourning day. On this day every year the people would be paying homage to the memory of a man who became a legend in his won lifetime. 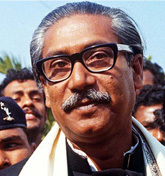 Bangabandhu lives in the heart of his people. 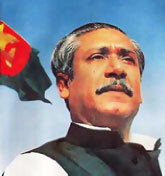 Bangladesh and Bangabandhu are one and inseparable. 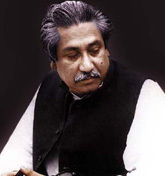 Bangladesh was Bangabandhu Sheikh Mujibur Rahman’s vision and he fought and died for it.